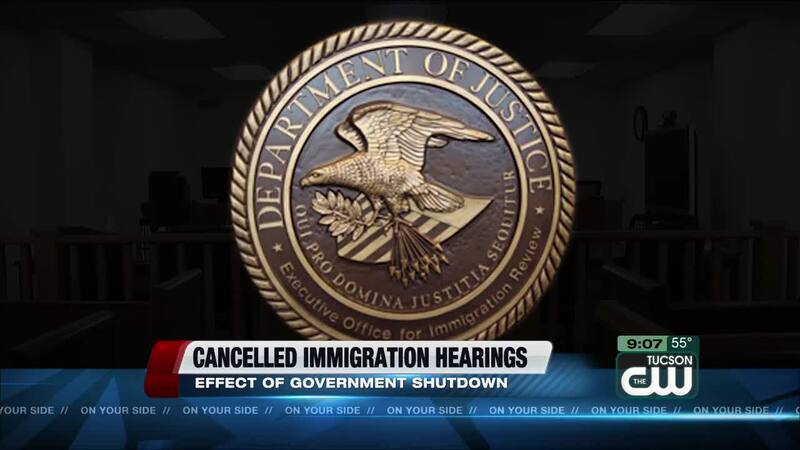 TUCSON, Ariz. — The partial government shutdown has closed most immigration courts across the nation, forcing judges to cancel or postpone hearings. The same goes for Tuscon's immigration court. Due to the shut down, court operations are limited to cases involving detained individuals. Non-detained cases will be rescheduled when the court reopens for regular operation. Into the fourth week of the shutdown, the nation's immigration court systems are now at a halt with many lawyers, judges, and staff furloughed. According to TRAC Immigration , a website monitoring immigration cases, an estimated 67,427 hearings are canceled statewide; and 997 of those are from Arizona. For West, Longenbaugh, & Zickerman, attorneys Mendoza and Marco Costa are trying to figure out how to best protect their clients. "With immigration, especially with immigration courts, well, the situation is different. The cases in immigration court are suspended or delayed," said Costa. Creating a pile of hearings on top of the federal court's already backlogged case load. "If this slow down continues past January 25, in federal court, there's going to be more of an effect. And so they're going to have to parcel out certain cases that have to do with safety first and really put everything else on the back burner," said Mendoza. The attorneys emphasize that continuing to postpone cases can be a violation of a client's due process. And for immigration hearings, a client's legal status could expire. "There are clients that are going to be in that dilemma. If they make a mistake, we have to go to immigration court, we have to go to federal court for a mandamus to seek review, how can we do that if the federal court's shut down?" said Mendoza. As for visas, that process to apply is not impacted since it is fee-funded.